An offer from Kathy Voth, On Pasture editor and weed-eating animal trainer…. You can teach your livestock to eat weeds and I’m here to help at whatever level works best for you. How to use a cow’s natural behaviors to get her to eat a weed in as little as five days. I’ll email your training plan (that will look a lot like this). With this option you’ll get all the benefits of understanding how easy it can be to teach livestock to eat weeds plus you’ll get a recipe for success. I’ll tell you what you need to know about Canada thistle. I’ll give you a list of supplies, and then tell you what to do, one step at a time. I’ll tell you what your trainees will do at each step, and if they don’t how to make small modifications that will get them headed down the right road. Best of all, if you run into something that doesn’t make sense, you can email me and I’ll write or call you back to make sure you get the job done. It’s a deal that normally costs $150. So how can you go wrong?! And why would I do this? Because I’ve been trying to show people how easy this is for 11 years now, and I’d like to see the concept FINALLY take off so that I can move on to something else! 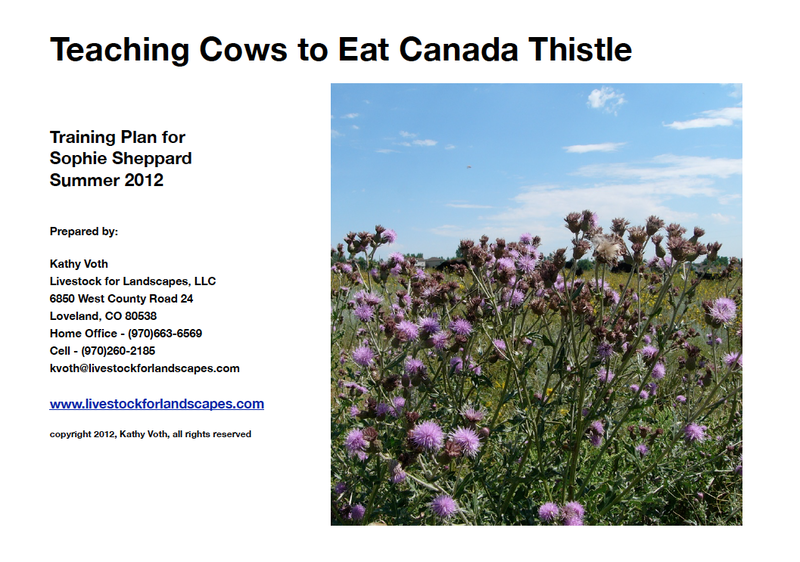 Want to Work on Something Other Than Canada Thistle? We can do that too. Just drop me a note to tell me what your weed of choice is and which option you’re interested in. I’ll let you know if it’s edible, and then get you set to go. Or Do It For Free! Here are links to articles and to my Youtube channel that will give you the information you need to teach your cows to eat weeds. Whitetop/Hoary Cress – Whatever You Call It, Livestock Love it!